Joint winners of the Senior Women’s Cup were Merle Munro and Joanne Begg, each with 42 stablefords, although Merle won out on a count-back for the day’s Stableford competition. The other haggle winners on the day were Sara Porritt, Jane Fraser (41), Barbara Taylor (39), Anne Hawkins (38), Sue Ferguson, Karen Kingan (37), Carol Plowman, Jenny Tibby, Sue Rennie (36), Imelda Woolston (35) and Elaine Couper (34). Nine hole Stableford winners were Wendy Grierson, Anne Hodges and Shirley Barton. Thankfully the threatened rain came to nothing. A field of 39 turned out for today’s LGU competition. The standout winner, with a nett of 63, was Margaret Steedman. Margaret’s big win occasioned an immediate wiping and updating of the Shootout board. Under the heading ‘other winners’ were Jane Fraser 66, Sara Porritt 67, Christina Jilesen and Merle Munro 69, Wallis Jones 70, Julie Owen, Sue Virtue and Joanne Begg on 71; Barbara Taylor and Glenda Street on 72; Lynne Bacon 73; then Marion Johnston, Linda Smith and Daphne Ferguson on 74. In conjunction with the LGU competition, players could enter the National Teams Event which will see the four top qualifiers representing our club at the National Teams Event in May, held this year in Te Awamutu. Congratulations go to Jane Fraser, Joanne Begg, Karen Kingan, and Pauline Mills. The nine hole winners were Wendy Grierson and Anne Hodges on 31 followed by Eileen Kay on 34. The weather gods were smiling on Saturday as 36 players took to the fairways in excellent conditions. A small group of our lower handicap golfers had travelled to Putaruru for Pennants on the Sunday, thus reducing our numbers from the excellent 45 the week before. However the numbers will be back up this week for the first round of the Tarrangower Shield. The format for the day was Russian Roulette. It was a fun day where teams of two multiply their stabelford scores on each hole. For example one player gets three points and his partner gets two, then the team scores six points. It is unfortunate when one team member scores a three or four pointer only to have his partner score zero points. The teams score is then….zip. Always good to play something a little different. A large field of over 40 members turned out on a beautiful day for the first round of the Stableford Trophy. The day’s haggle winners were: Merle Munro (44), Lynne Bacon (42), Susan Virtue and Annette Tylee (41), Margaret Steedman, Elaine Couper, Jill Burton, Cara O’Donnell, Marion Johnston and Barbara Corney (40), Chris Edkins and Jose Heale (39), Pauline Mills, Joanne Begg and Linda Smith (37). Nine hole winners were Anne Hodges (19) and Jeanne Gomas (18). For a couple of players, returning to golf after a long break meant that quite a number of the eighteen holes were spent finding unvisited parts of the course, revisiting some areas and even going backwards with sudden warnings to others to “look out’. Bursts of laughter helped to keep them from giving up with surprising moments of form stabilizing to some satisfactory golf. The card checkers would be forgiven for thinking that in each case two different people must have played the round. Despite chants of “wet before seven dry by eleven” and “the forecast was for rain clearing” the umbrellas went up and never came down. Soon the course was definitely squelchy with puddles forming, and the large areas of sunburnt grass turned slippery. Occasionally the drizzle would let up just to hose down again – ghostly manic laughter coming from the heavens. Nobody was expecting great scores and they were right. My partner and I were the last to trail in absolutely ‘drookit’ and it would be fair to say that neither of us realised that she had the winning score for the day. 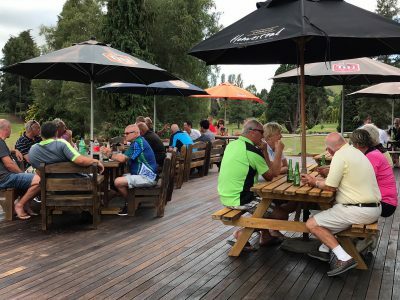 The 2019 Taumarunui New World Heaps Golf Classic saw 116 players assemble from 15 clubs around the North Island to compete in perfect conditions and produce some SIZZLING results. 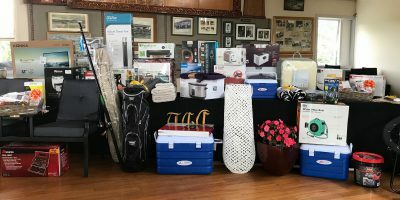 Thirty nine stablefords or better were needed for even a sniff at the $6,500 prize table. Local Erik Lei, playing off a 16 handicap returned a blistering nett 59 to take the best nett. 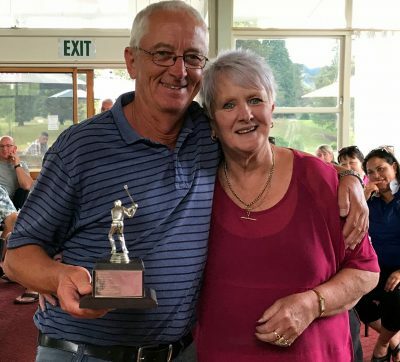 Turangi’s Chris Turner, on a nine handicap, played 69 – two under par, to win best gross. Two locals took out the top mens and womens stableford; Carol Plowman with 45 and Greg Simpson 44. Forty nine players out of the 116 had 39 points or better. 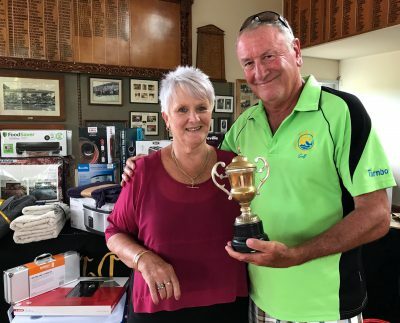 Other good scores included Lance Tibby (Taumarunui) 43, Christine Edkins (Taumarunui) 43, Christina Jilesen (Taumarunui) 42, Paul Dowie (Taumarunui) 42, Neville Keys (Waiuku) 42, Matt Short (Omokoroa) 42, Duane Dixon (Waimarino) 42, Robert Edmonds (Waimarino) 42. Erik Lei – best nett player of the tournament had the trophy presented by Sue Jordan. 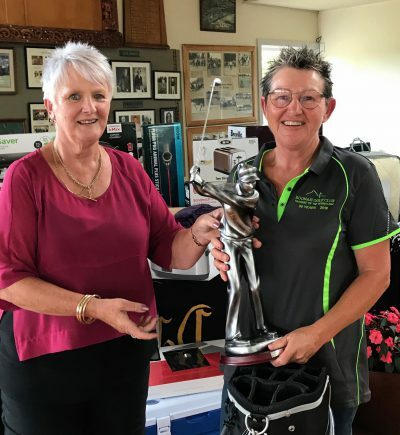 Carol Plowman (Taumarunui) won best Ladies Stableford with 45, presented by Sue Jordan. 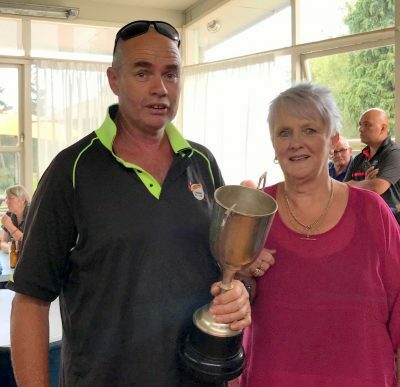 Heaps committee member Sue Jordan presents Chris Turner (Turangi) with Best Gross Cup for his 69. A portion of the Heaps prize table. Local Greg Simpson took out the Mens Stableford prize with 44. Some of the early finishers relax on the deck.